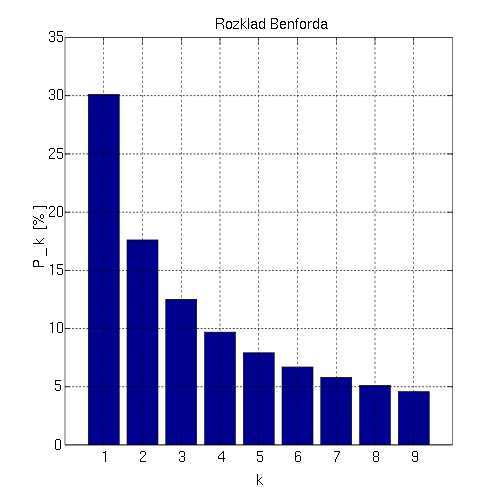 Benford's law, also called the first-digit law, states that in lists of numbers from many (but not all) real-life sources of data, the leading digit is distributed in a specific, non-uniform way. According to this law, the first digit is 1 about 30% of the time, and larger digits occur as the leading digit with lower and lower frequency, to the point where 9 as a first digit occurs less than 5% of the time. This distribution of first digits is the same as the widths of gridlines on the logarithmic scale. Benford's law also gives the expected distribution for digits beyond the first, which approach a uniform distribution as the digit place goes to the right.